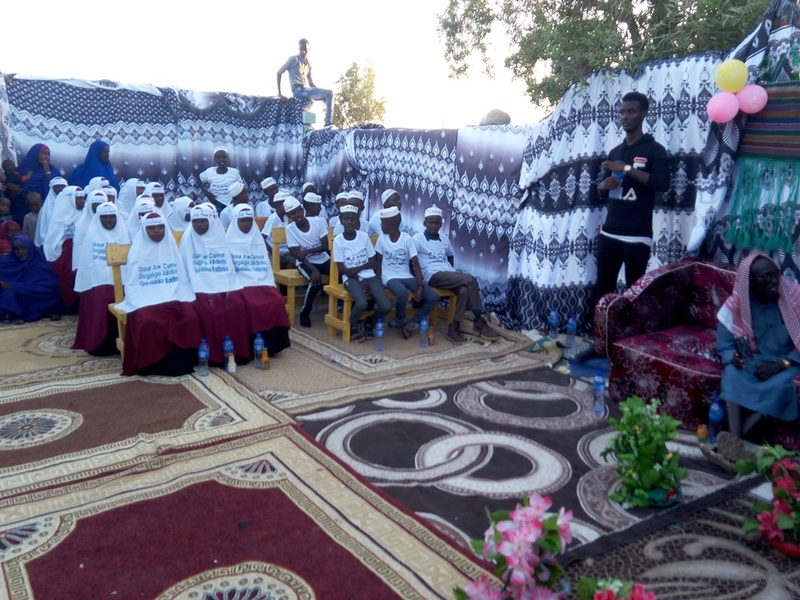 More than 2,500 AK-47 automatic rifles were seized from a stateless skiff in the international waters of the Gulf of Aden at the end of August. U.S. Navy sailors aboard the guided-missile destroyer USS Jason Dunham (DDG 109) discovered the illicit weapons shipment during counter-trafficking mission on August 28. 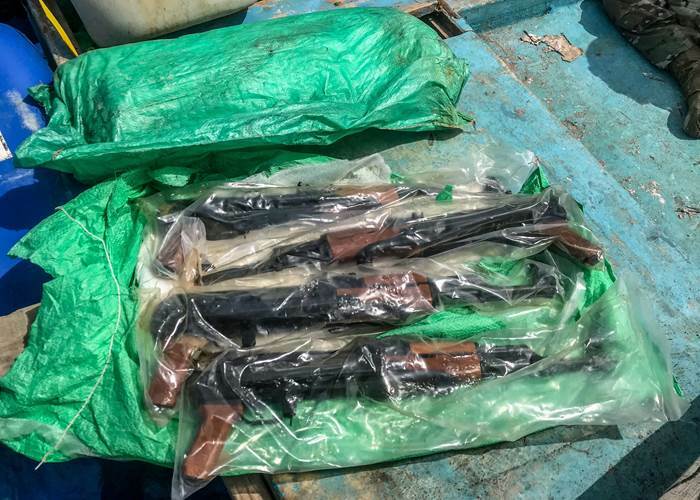 The Navy said 2,521 guns were confiscated from the skiff, which was determined to be stateless following a flag verification boarding conducted in accordance with international law. The origin and intended destination of the skiff have not been determined. 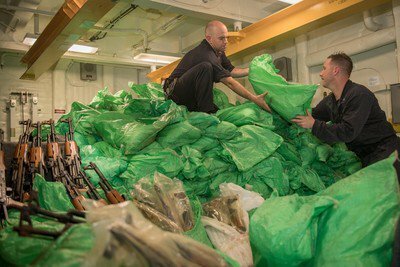 The recent weapons seizure follows four major weapons seizures in 2015 and 2016 by Combined Maritime Forces and U.S. 5th Fleet assets. In September 2015, the Royal Australian Navy's HMAS Melbourne intercepted a dhow containing 75 anti-tank guided munitions, four tripods with associated equipment, four launch tubes, two launcher assembly units and three missile guidance sets. 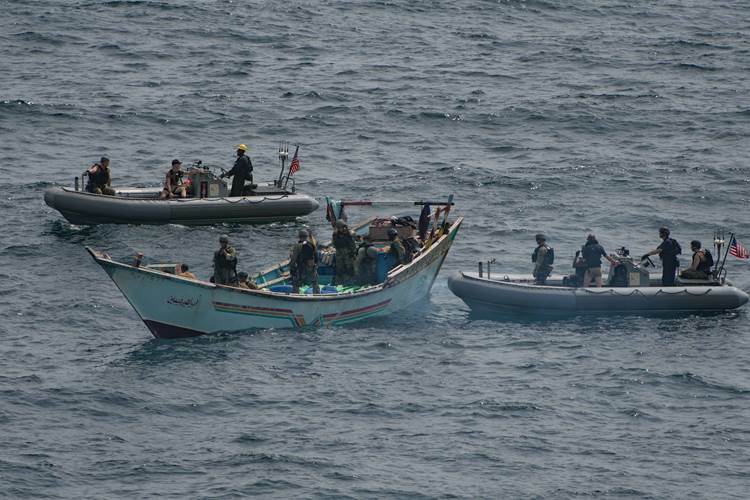 The second seizure, also made by the Royal Australian Navy, saw the HMAS Darwin seize nearly 2,000 AK-47 assault rifles, 81 rocket-propelled grenade (RPG) launchers, 49 PKM general purpose machine guns, 39 PKM spare barrels and 20 60mm mortar tubes from a dhow in February 2016. In March 2016, the French Navy destroyer FS Provence confiscated almost 2,000 AK-47 assault rifles, 64 Dragunov sniper rifles, nine anti-tank missiles and six PK machine guns with bipods. Later that month, the U.S. Navy coastal patrol ship USS Sirocco (PC 6) intercepted a dhow carrying 1,500 AK-47s, 200 RPG launchers and 21 .50 caliber machine guns. The U.K.-based investigative organization, Conflict Armament Research, studied and linked three of the caches to weapons that plausibly derive from Iranian stockpiles. Based on an analysis of all available information, including crew interviews, a review of on board records and an examination of the arms aboard the vessel, the U.S. concluded that the arms from the four interdictions in 2015 and 2016 originated in Iran and were intended to be delivered to the Outhits in Yemen in contravention of UN Security Council Resolution 2216.